Kamekujiraneko is my friend. He is against whaling and supports protection of other sea animals. 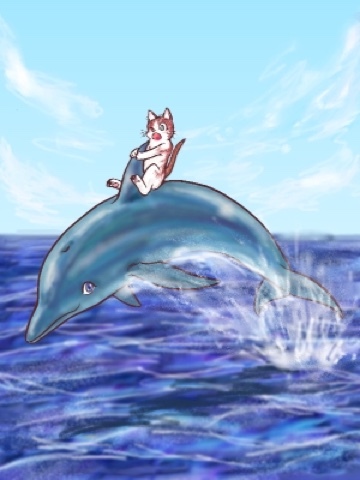 He writes fictional story books about Whales and whaling. There are many people who are against this person and is attacked from everywhere. The stories he writes are fiction but demonstrates in his words how humans are ignorant. He displays the beauty of sea animals by using his words and pictures. I hope that this story will touch the hearts of many adults and children all around the world. What in the world were they looking for on the vast expanse of the ocean? They were looking for whales! In fact, they were on a whale watching ship. Whales, as you know, are huge mammals that live in the ocean. They are the largest animals in the ocean. He really loved fish -- fresh, fried, or broiled, and he turn up his nose at canned fish either! Actually-he was a glutton! 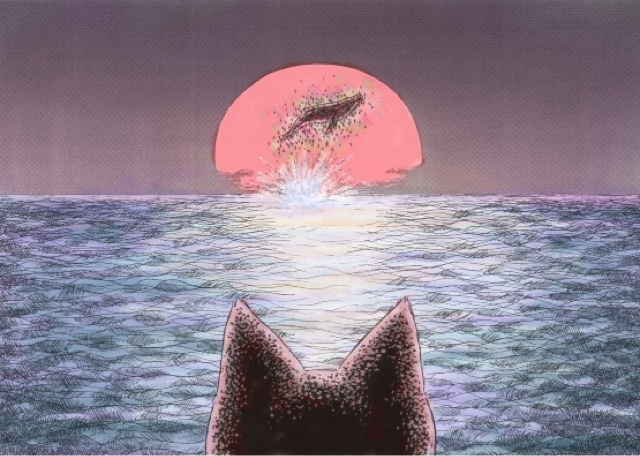 He had heard that whale meat was delicious, and he dreamed of having a chance to taste it. 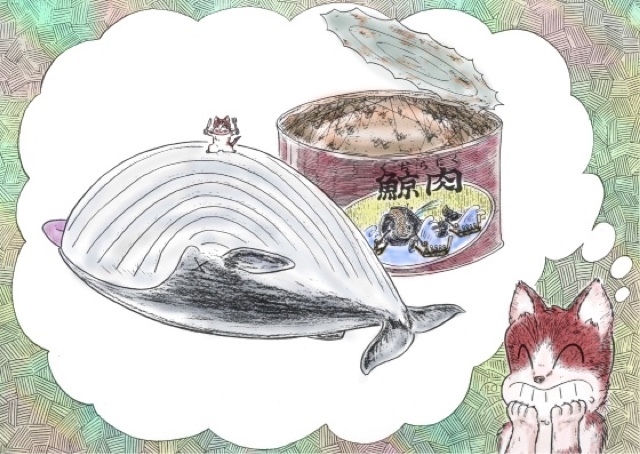 Imagine-how many cans of whale meat could you get from one whale? A hundred? A thousand? Or many more, too numerous for even him to eat? With that many cans he could feast for a whole year and have plenty left to share with his friends. 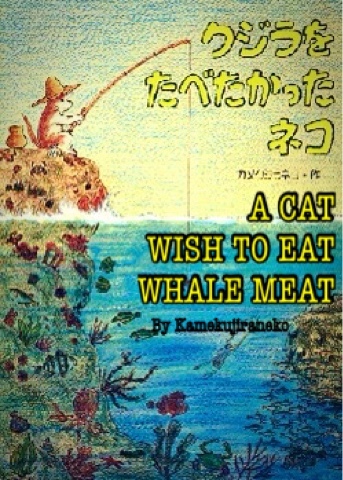 Sad to say, there are still some people who like to eat whale meat, but nobody had ever given the cat any. Therefore he had made up his mind to go on a whale watching ship to catch a whale! That is how he ended up on this ship. He had heard that this rather large ship used to be a whaling ship that sailed the seas of the world searching for whales to catch-going as far as the freezing Antarctic waters at the bottom of the world. The seas used to be teeming with whales, but humans had caught so many whales, that there are very few left in the oceans. Therefore this ship was no longer a whale-catching ship, but a whale watching ship for tourists. The ship's guide had brought recording equipment aboard, and he lowered a microphone overboard in order to try to record whale songs. The tourists gathered around the equipment speakers with their ears straining to catch the sounds from the sea. The people were enchanted with these mysterious sounds coming out of the speaker. They had never heard such songs before-they seemed to be music from another world. Junior came close and listened intently. These songs were nothing like the love songs of cats! Such beautiful songs coming from the whales must mean that whales are very delicious to eat, he thought. His mouth watered. The whale songs were so loud that Junior and the tourists thought that a whale must be nearby. They again started to scan the horizon. Some of the tourists were using binoculars, and the others shaded their eyes with their hands to see better. Everyone was eagerly looking for whale blows. Unfortunately, Junior could not see any signs of whales at all. Junior's eyes hurt because of the strong light from the sun reflecting on the mirror-like sea. He squinted to protect his eyes from the glaring light. His irises became mere slits. His fur was salty and moist from the misty sea water. "Oh, look there, a blow!" a cry arose. He looked in the direction the people's fingers were pointing at, and saw something black emerging from the sea. He saw the water and mists spouting out of a whale's blowhole. After a few blows, the whale dove back into the sea. By that time, the ship had slowed to a stop. After a while, a group of three or four whales appeared. They swam together playfully. One of them started to jump above the sea. He raised the upper half of his body, made a slight twist, and plunged back into the water, flapping his tail on the ocean's surface. A roar of sound reached the ship. 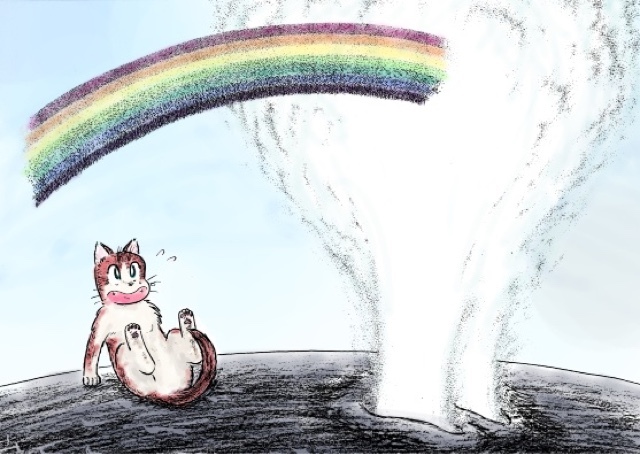 Then, a column of water spewed out into the air -- it was magnificent to look at. One whale after another followed suit. "Were they engaged in a water blowing competition?" Junior thought to himself. All the tourists on the ship were excited and entertained by this spectacular whale play! The whales started to move away. The ship's engine started with a roaring noise; the chase began. The ship increased speed and pushed its way forward, making water splash onto the deck. Junior clenched his teeth and tried hard to hold himself steady on the deck. Probably having noticed the chase, the whales swam faster. 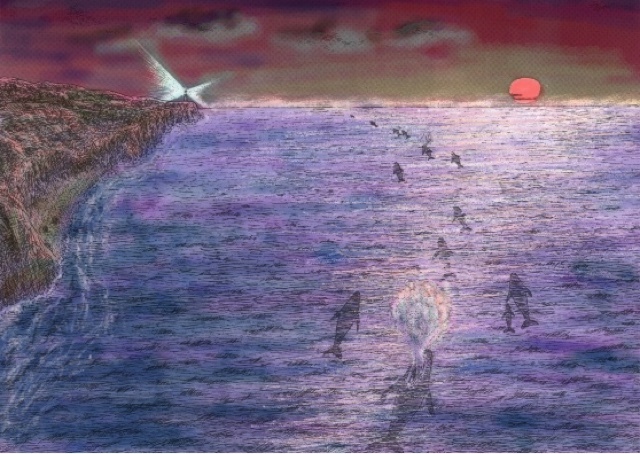 They moved faster and faster while making giant leaps above the water's surface. All of a sudden, a large swell hit the ship sideways surging over the rails. 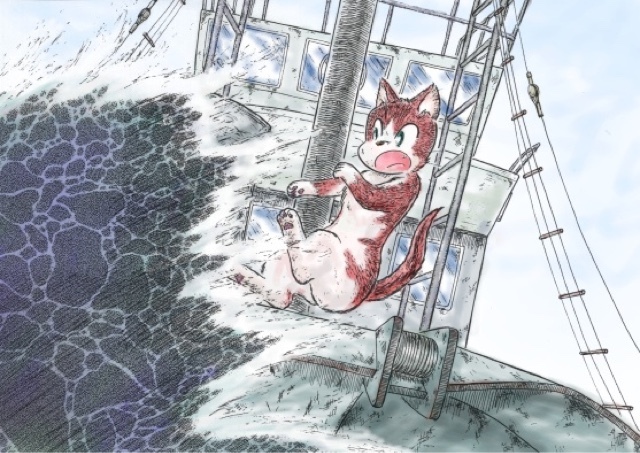 In an instant the swell hurled Junior off the ship into the sea! It was so sudden that he had no way to prevent it. A moment later, he found himself in the midst of a swirl of boiling ocean. Loud, deafening noises terrified him and he couldn't help swallowing some water. He felt salty water coming into his nostrils and ears. "Help, help, I'm drowning!" he cried with muffled voice; he suffered terribly from the water he had swallowed. In order to breathe, he desperately tried to get out of the water, moving all four legs as fast as he could. Fear and suffocation struck him and he thought he was dying. He ceased to fight -- and the sea became calm, turning blue all around him. Junior drifted in the blue ocean. To his surprise he no longer felt suffocated; the pain was gone, and he was now able to breathe normally. He felt, however, numb in his limbs. He was astounded to find himself without legs! Instead, there were fins where his legs used to be. "Well", he thought "there is no use mourning the loss of my legs -- fins are more useful than legs in the ocean!" The fins felt familiar -- had he once lived before in this aquatic world? The sun was no longer visible; but light seemed to come from all directions as in a kaleidoscope. The world where he used to walk on his four legs was unreal -- this dream world was real, he thought. He felt delighted and happy here. Suddenly a dark shadow appeared above him and made him awake from his dream-like state. With noises hissing and water vibrating, it started spreading around him. He recognized it as a fishing net. The net covered him. Thrashing desperately, he tried to get out of it as hard and as fast as he could before he became trapped and immobile. The harder he tried to escape, the more he seemed to be trapped in the net. If he were lifted up while being trapped in the net, he feared he would surely die. He called for help as loudly as he could. Junior opened his eyes slightly and saw the sun shining brightly. He was alive, he thought, and he seemed to be in the open air and was breathing all right. He saw his usual legs and fur. His heart was ticking, too. Still feeling dizzy, he slowly looked around to see where he was. In front of him he saw the vast ocean reaching to the horizon. His memory started to come back to him, and he now recalled what had happened to him earlier. He remembered he had been thrown off the ship and had almost drowned in the ocean. The place around him was not familiar. He wondered where he was now. Was he washed up on a remote island? The spot on which he was sitting seemed to be moving up and down. While he was trying to figure out his whereabouts, a geyser of water burst into the air with a loud roar. He saw two hollow cavities nearby, which were larger than his body. Through them clouds of water were spurting out, like a fountain, spreading mists all around. It smelled so bad that he gagged! Soon a small rainbow formed in the sky. "Are you awake?" He heard a voice coming from somewhere. He looked around, but he found nobody nearby. "Here, here. Just under your feet!" the voice spoke. He started to move closer to where the voice seemed to have come from. "Wow!" Junior cried. 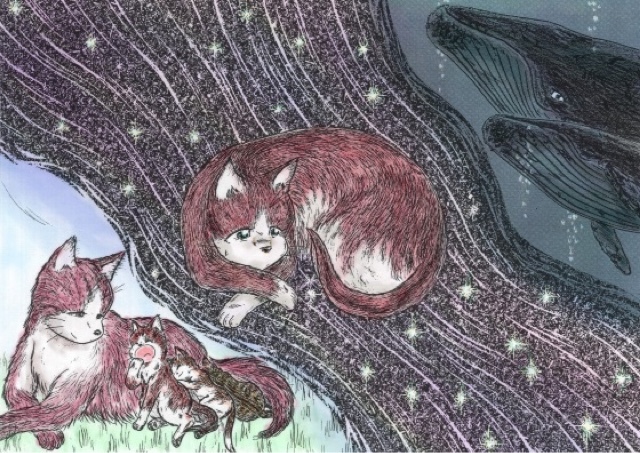 A gigantic creature with huge eyes was gazing up from the water at him. It was a whale. He realized that he was standing on its back. While on the ship, he had gathered that whales were big, but he did not understand how huge they were until he was standing on one of them. 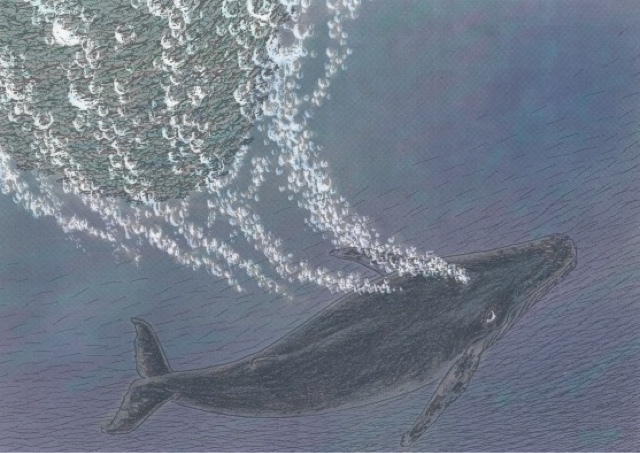 "Gee, this whale will make about a thousand cans of meat -- no, much much more," he blurted out. Realizing he had made a stupid remark, he immediately shut his mouth fearing that the whale might have heard his words. 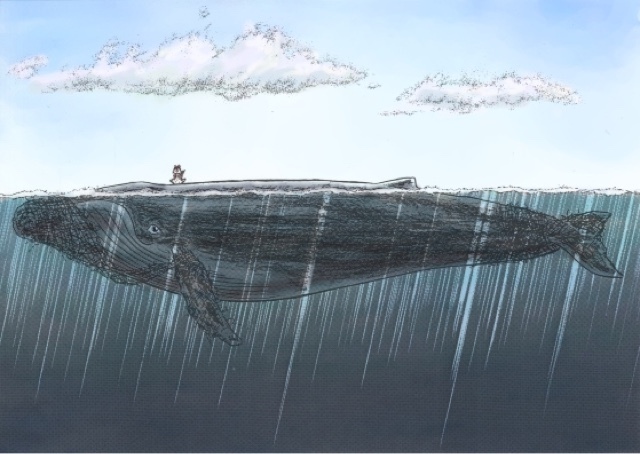 If it got angered, he feared the whale would swallow him in a gulp. In an attempt to appease him, he licked the whale's back several times in spite of the whale's bitter, salty taste. Then he felt a jolting sensation. The whale was chuckling. "You are the one who saved my life?" he timidly asked the whale. "No, I did nothing much," the whale replied. "I saw you floating in the ocean, and I just gave you a ride on my back. You were lucky. A god, I say, the god of the cats protected you. But I don't think I can help you any more. I am so exhausted and weak." Now the whale's voice sounded feeble. What is the trouble?" asked Junior. "I am trapped in a net." the whale replied. 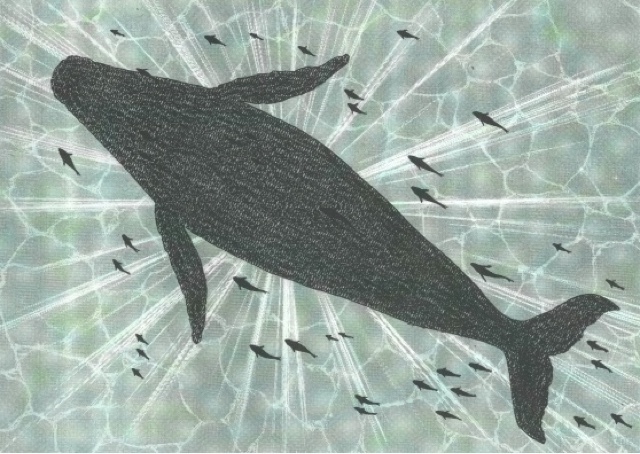 Puzzled, he walked along the whale's nostrils toward the front of his whale's head. As the whale had said, he found the net, some of its strands ripped, wrapped around the whale from his head to his breast fins. The net seemed to be tightly attached to him. The whale explained his predicament. "I tried to get out of the net. The more I tried, the tighter the net wrapped itself around me, so tight that I can hardly move my body. My fins are damaged. I am losing strength and can't swim fast. It's been almost ten days since I have been like this." "Did you say ten days?" Junior cried and said, "How did you manage to eat?" "During summer time, we eat a lot and make a lot of blubber inside our bodies. That blubber will keep us alive without eating for a long time." Junior felt sad for the whale who had saved his life, and he wanted to free him from the net. He put a strand of the net in his mouth and tried to bite it through. Though he was proud of his sharp teeth, the strand was too strong for him to cut. He tried and tried until his mouth began to hurt. He finally said haltingly, "It is too tough. Humans make too strong a net. I cannot cut you loose." Junior tried again to free the whale without success. He gave it up, and then there was nothing to do but watch the open sea. After a while he got bored watching the sea, and he asked the whale, "Sir, how do you like living in the ocean all the time? On the land, there are woods, forests, rivers and the like, but what about in the ocean?" "Well, well. I don't know anything on the land as I have never been there, but the ocean is, I think, as fascinating as the land." "For one thing, there are currents of sea water similar to rivers on land. A current carries warm or cold water in a certain direction." "And there are woods of coral reefs and forests of sea weeds. There are so many different kinds of creatures living in the sea! Some of them swim, and others float. And some crawl along the sea beds, while others seldom move at all. Some are huge in size just like I am, while others are tiny, too small to even see. Some have beautiful decorations and patterns. Some are poisonous. Some live in groups, while others live by themselves. There are friendly ones and fierce ones. There are cowards who are always on the run, and others are fighters. Oh, yes! And you know, the ocean is filled with many kinds of sounds. Do you know, we pass messages to each other through different sounds?" 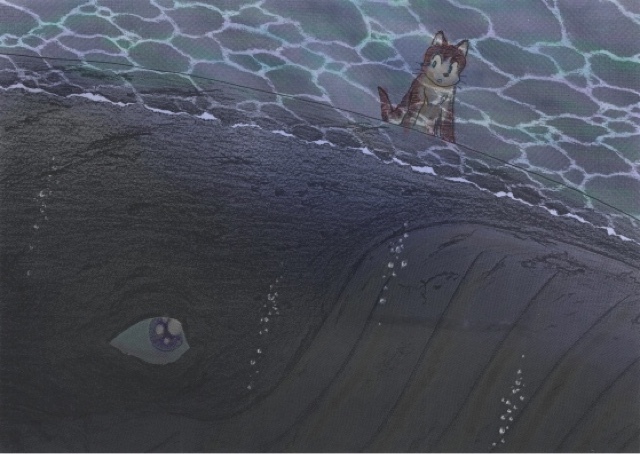 It seems an interesting world, thought Junior, though he did not know any of the creatures the whale had mentioned. "What is your name, little fellow?" asked the whale. "They call me Junior--and you?" "Well, Junior, why don't you call me Senior for the time being?" chuckled the whale. "I'll tell you about my folks", Senior continued. "Every year we travel between the south and north, just like migratory birds. As they fly from one continent to another when the seasons change, we likewise follow the seasons from one part of the ocean to another. In summer there are a lot of plankton, small fish and shrimps in the cold arctic seas. We feed on them. And when winter comes we head back south to the Antarctic." "When we have babies we all move to a warmer area to raise our children." Seemingly lost in memories of his past, he talked slowly and intimately to Junior. Each word sounded grave and touching. "Some get lost on their way and stray off the regular course. around me like this ... Even though I am here now, my heart is with them." His voice was filled with sadness. Then he added, "We travel along the coast lines. We remember the bays and capes we've passed before, so we can reach our destination safely and easily." "Look! Here come some interesting creatures," said the whale. Junior looked around to find out what was so interesting. He saw some strange-looking fish with big fin wide open like wings. They flew across over the crests of the waves. They darted in and out of the water. "They are indeed called flying fish." explained Senior. 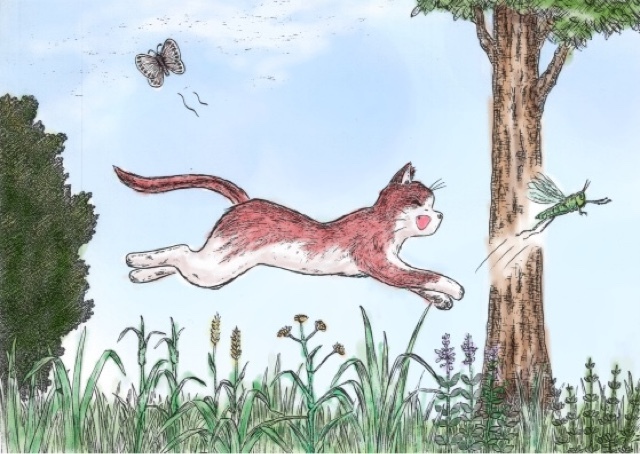 "I never imagined that some fish can fly like birds!" Junior exclaimed. "The fish must have learned how from them." Senior looked in the distance and spoke. "Well, it may sound strange but we whales are mammals like land animals, although we live in the sea. Are you surprised at that too?" "You must be kidding. You are not a fish but an animal?" "Yes, I am an animal", Senior replied." Junior was taken aback by that; he was at a loss for words. 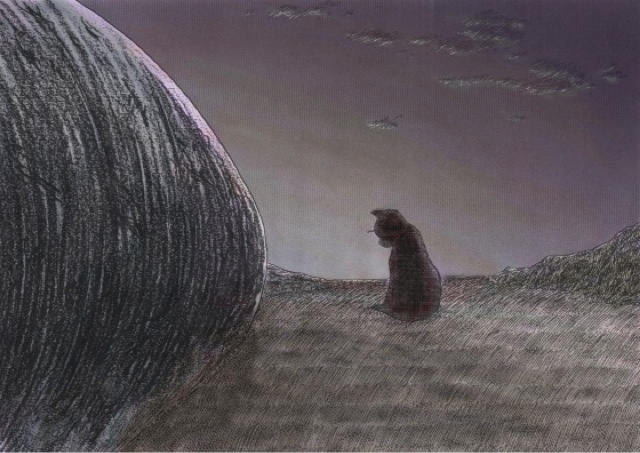 He was not convinced yet, but he thought it was possible that the two holes he was sitting near could be nostrils such as large animals on land had. He had been sure that Senior was a big fish. Embarassed, he covered his face with his paws. Senior explained to him: "Our ancestors came from the land and chose the sea to live. So, Junior, we are sort of distant cousins." Upon hearing the words, "distant cousins", Junior forgot any doubts he had had, and his curiosity overcame his timidity. He now wanted to know about the whale. He asked Senior, "Do you like to sing songs and jump in midair?" "Yes. I am a humpback whale. Among all the species of whales we are the best singers and jumpers." "Well, can I ask another question?" "How come you can jump in midair when you weigh so much?" 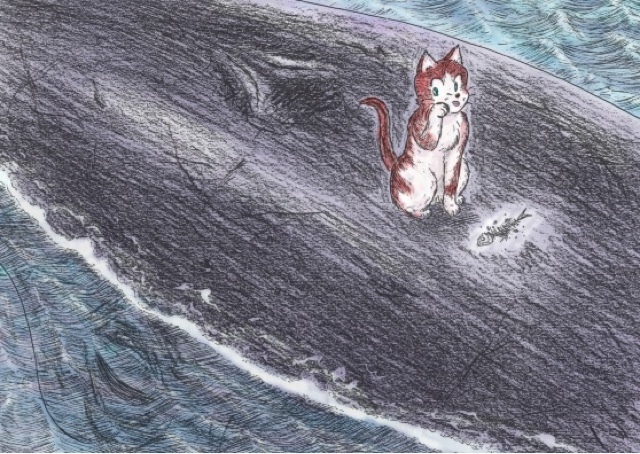 He had seen the whales jumping when he was on the ship, but he still could not believe that a whale as big as Senior could jump so well. "How can a whale, as big and heavy as you are, lift your own body out of the water? It seems impossible to me." Senior paused and said as if to assure himself. "My friends help. We give each other the signal to start. We swim faster and faster, building up our speed. Then we dart upwards breaking the water's surface, into the air. After pushing our bodies up out of the water, we lower our heads and dive back into the sea while banging our tails on the water's surface. It's fun and gives me a thrill. We sometimes compete to see who are the best and longest jumpers. You are a cat, Junior, so you probably don't understand what a pleasure it is." It was hard for Junior to imagine jumping out of the water as play. He hated water! He was light and he had easily chased rolling balls, and leapt up into the air to catch flying insects. Whales could do big things with their big bodies, he thought. "Junior, have you ever seen us jump from the water and sing songs?" asked Senior. "Yeah, not long ago I was watching you guys from the ship with all the humans on board." he replied. After hearing the word humans, the tone of Senior's voice became bitter. Sensing the change in the tone of his voice, Junior thought it wise to change the subject to whale singing. 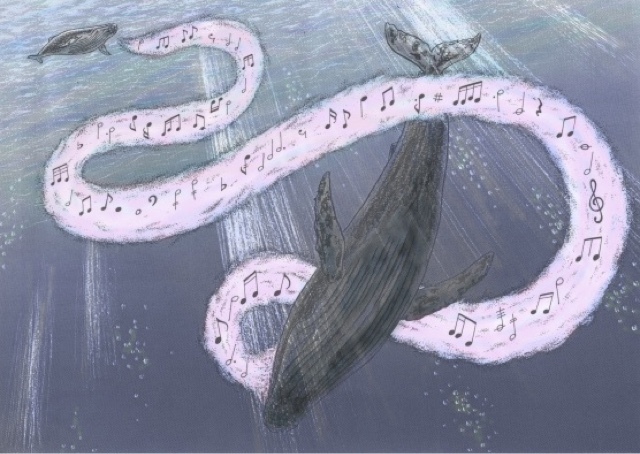 "When it comes to music, you whales have beautiful voices. When I heard you sing I was very touched". Junior flattered him. A bit exaggerated his praise may have been, but his words were not totally untrue. Senior seemed to be pleased with Junior's compliments. "Thank you for saying so. Let me tell you, Junior, a little about our songs. For different events, we have different tunes and melodies. We sing combat songs before fighting against rivals, though I would not say I am a fighter. We serenade our loved ones. The better you can sing, the more you'll be loved. Before setting out to fish, we sing our prayers for good catches. We have many more songs." Junior was impressed by how important songs were for the whales. "You said you went fishing, but please tell me how you whales catch fish," Junior asked. "You mean nets like the one around you ..." Junior asked, pointing at the mesh of the net on Senior's head. He wondered how the whales could make such a net. Senior did not seem to have any tools but his fins that might be useful in making nets. He did not seem very dexterous, either. 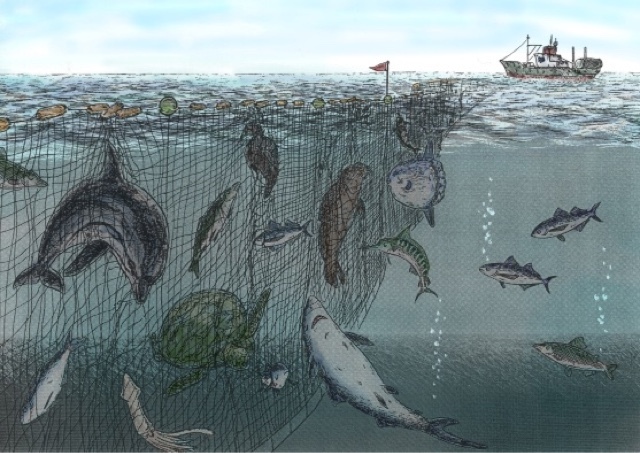 "We don't use harmful nets like the one on me," said Senior. "We whales are gifted with natural nets. It's a god-send, as you may say. When we spot a school of small fish like herrings and sardines, we first swim deeper and get underneath them. We puff out air at them. The air becomes bubbles forming air nets. 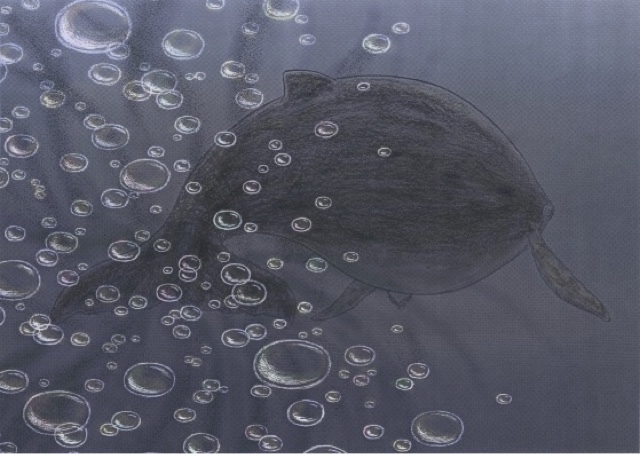 We swim in a circle below the trapped fish. When the fish clump together in panic, we swoop up and gulp them." Junior was amazed at the thought of such a scene. What powerful methods the whales possessed. Thinking of fish, his belly growled with hunger. "You seem hungry," said Senior with a chuckle. "That was a good story you told me. Thanks! Yes, I am getting hungry now," said Junior. He regretted he had not eaten enough before boarding the ship, but it was too late to cry over this oversight. The flying fish flashed into his mind. There were plenty of them, and they could have satisfied his hunger, he thought. Now there was nothing to eat that he could find here in the open sea. "Junior, look down in the water," said Senior. Junior had been thrown into the water and had almost drowned. The memory was so fresh that he could not make himself get closer to the water. Senior extended one of his breast fins and invited him to hop onto it. Unable to refuse his kind offer, Junior got onto it and from there looked down into the water. He saw many kinds of fish, both small and large. He was astonished to find them, right under his nose, gliding here and there. "Junior," said Senior. "Small fish like to stick around a mammoth like me. It is like hiding under a floating raft. They want protection from predators. We try to live in peace together." Junior could see some fish almost within his paw's reach. The fish right under his nose whetted his appetite, but he could not think of any method of catching them. 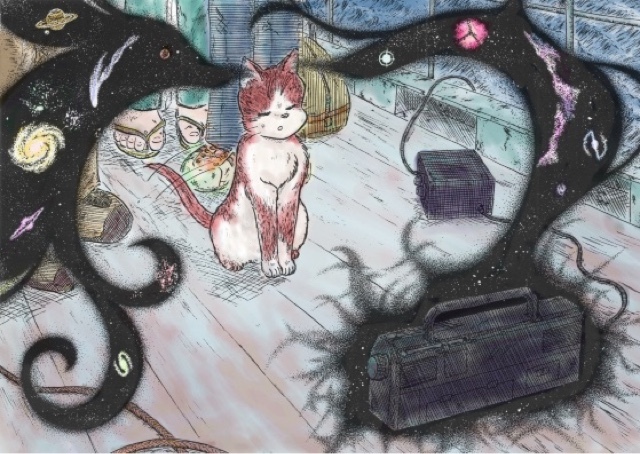 "Why don't you ask the God of the cats how to catch them?" Encouraged, Junior racked his little brains hard for a while. A bright idea flashed into his mind. "Senior said he has air-nets -- I'll try a fishing pole." He moved to the edge of the fins, turned his back toward the sea, and dropped his tail into the water. He jiggled the end of his tail the way his mother used to do with her tail to keep him calm when he was a kitten. He had never used his tail to catch fish this way, but he hoped this impromptu method would work somehow. A while later he felt a fish snap at the tip of his sensitive tail. No sooner had he sensed the bite than he jerked his tail out of the water. To his amazement, he saw a fish of medium size dangling from his tail. That would be plenty for his supper tonight, he thought. "I got it, I got it!" Junior felt a little guilty at having such a feast while sitting on the whale who was unable to eat. But, since Senior told him to help himself to the catch, he took the liberty of eating it by himself. His stomach full, Junior posed a puzzling question to Senior. "I wonder why you whales eat only small fish. Your mouth is big enough to swallow bigger fish as large as myself." "Yes, our mouths are large--but instead of teeth we have something called baleen plates that filter our food, and we can only eat small fish and plankton." On occasion, Junior had eaten canned tuna fish and mackerel. They had tasted delicious to him. But whales, he thought, did not seem to be interested in such fish, which abounded around them. 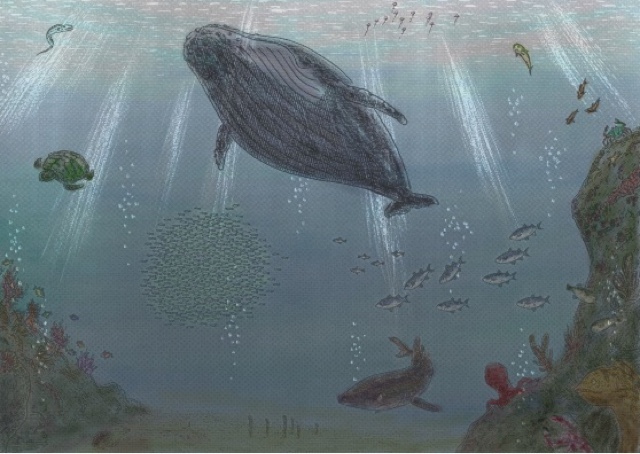 It seemed a shame to him that the whales, though their bodies were so big, could only eat small fish and plankton. "You did not seem pleased when I told you I had been on a ship with humans. You hate humans, don't you?" asked Junior. 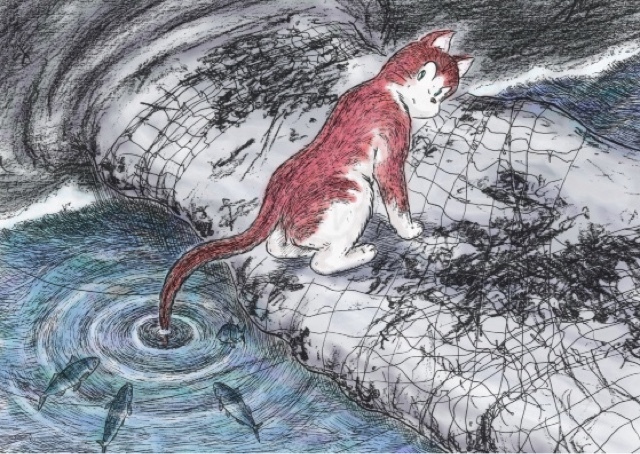 Junior thought that Senior's grudge against humans could be caused partly by the fishing net in which he was entangled now. At any rate, Senior seemed to dislike humans whatever the real reasons were. In spite of Senior's huge size, his talents in singing and jumping, and his vast knowledge of the sea, he would be no match against brutal humans, Junior thought. "It's not that I hate humans so much because they killed us," Senior continued. "While we are growing up or when we get weak from illness, we have other enemies like sharks and orcas who will kill us. The orca is a killer whale. We and the orcas have the same ancestors. They are the fierce and clever hunters of the sea. They are smaller in size than we are, but for all I know, they are the best hunters in the sea. When hunting, they work together well and share their catches. They are not merely feared by others but are also admired as well. They don't try to wipe us all out, though." "Well, I didn't know that you, the king of the sea, have an enemy". "We live on fish, but in the sea, we are no better than the fish. We and the fish live in a balanced state. No species flourishes better than any other. If so, that would cause trouble for the others. It seems that the sea was created that way. We don't have so many enemies, and so we don't have many baby whales." Senior went on. "We catch fish, but we catch them with our own natural tools. We catch them following our inborn instincts and knowledge learned from our parents. Hunting, searching for places to stay, and self-protection, they are all done with what we are given by God. The orcas, for instance, use their sharp teeth and their ability to swim fast." "However, humans use powerful tools like nets and boats to easily catch us who are much larger than they are. I was stupid enough to be caught by a drifting net which probably some fishermen discarded. I could hardly see the net's thin strands and got caught in the head while swimming through. Our nets are air bubbles and they disappear soon after they are made, but humans' nets, unlike ours, won't vanish with time. They drift like ghosts and trap living creatures to die. Many whales and dolphins have fallen victims to them and so have other fishes, sea birds, turtles and seals. My heart aches when I think of our young ones who are subject to such traps. We often have to come out of the water to the surface to breathe fresh air, and there is danger when their nets are floating around. Little ones are especially vulnerable, and are likely to die because they haven't gained enough strength to rid themselves of a net, once trapped. Of course, there are some fortunate ones who manage to escape from the nets." "How come human tools are so different from ours?" Junior asked. "I don't know it for sure, but they may have super-natural powers." "By the way, there is an ocean full of ice far down in the south." "I have heard of it before. It's called something like Antarctic Ocean, right?" Junior said. "Right. You heard of it before? Actually, it's called the Antarctic Ocean. A legend says that the whales lived there in peace for a long time. One day, many years back, all of a sudden, one big ship after another came there. Our ancestors were chased, caught, and killed by the ship people by some method unknown to them." 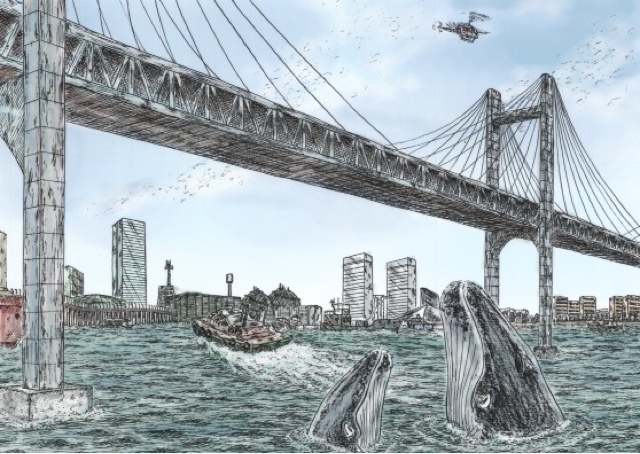 "It did not take too long before most of the whales had vanished from the rich, icy ocean. The 'singing tribe' and the large whales are all gone. Instead, all that are left there now are the smallest and swiftest whales. It's ironic that they were saved by their size. The ship people did not care too much for the small ones ... because they got less meat and blubber from them. They are, I should say, about one half of my size. Now that the big brothers are gone, minke whales, the smaller whales are getting the humans' attention." 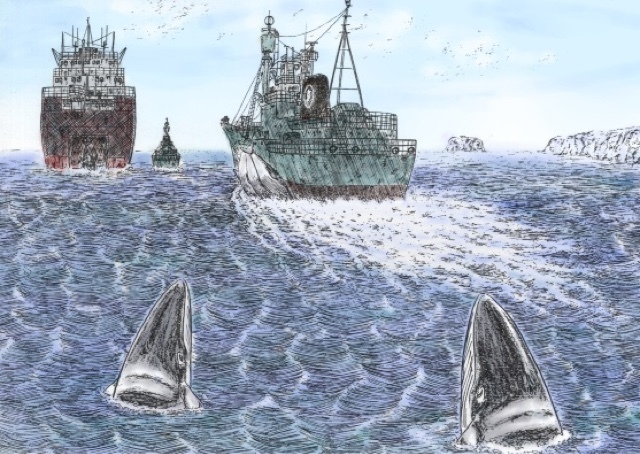 "They are now the targets of the whale ships." Senior continued. "If they should vanish from that paradise, that's the end of the world. In Antartica live penguins, seals and many kinds of fish. They all live according to their rules and roles. Each one is given his or her role by the God of the sea. If the whales perish from there, there would be no fish that could play the role of the whale, and the God of the seawould be at a loss as to what to do next." It occurred to Junior that that was why there was not as much whale meat in the stores as before. Senior said: "You know the humans cannot swim long distances. I was told that they use burning fuel to propel their ships. Humans call it oil, though. It comes from the bodies of creatures that lived long ago, lying deep under the ocean -- for many a century. Humans dig the sea beds and siphon off the oil. They use it for moving boats and ships in the sea. They are probably using it for other purposes on land. They carry the oil in huge tankers." "The oil is the problem; it causes us a lot of troubles. Do you know why? Tankers sometimes run aground. And oil gets spilled all over once there is an accident. 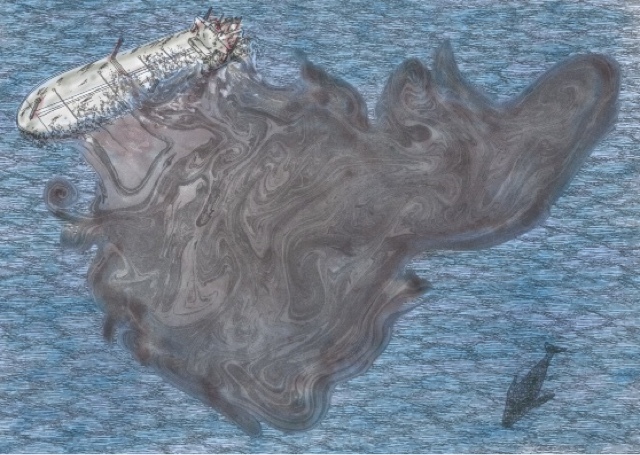 You cannot imagine the problems the oil spills cause!!. Our fins get darkened and tarred. Once it gets in the wings of a sea bird, he cannot fly again no matter how hard he flaps his wings. Some fish die after swallowing the oil spilt from shipwrecks. Many suffer from stomach illnesses. Seals' and otters' furs get damaged and some die from the freezing cold weather because their fur can't protect them well enough. I have seen many, many dead fish at the bottom of the sea who had lost their lives because they could not swim or breathe for whatever the reason might be. I'd be in big trouble, too, if I could not find small fish." Senior continued speaking. "Talking about debris, near the bays and coasts there are lots of soft, fluffy things drifting on the surface of the sea. They look just like jellyfish and some sea turtles eat them by mistake and suffer." What Senior had just said to him rang a bell for Junior. Was he talking about the plastic bags people used to bring back groceries from the stores? "The sea water nowadays is not like it used to be before. It is filthy and makes the fish become sick. It's all because of the humans dumping poisons in the water. The tiniest fish eat the toxins, tiny fish eat them, small fish eat the tiny fish, a little bigger fish eat the small fish, bigger fish eat less bigger fish ... The strange thing is the toxins don't go away. On the contrary, they get more and more toxic. They get stronger as they pass through the fishes' bodies. More and more fish get sick and die because of those poisons. We, the biggest ones, who live on fish suffer a lot. Some of my friends have died from mysterious diseases. 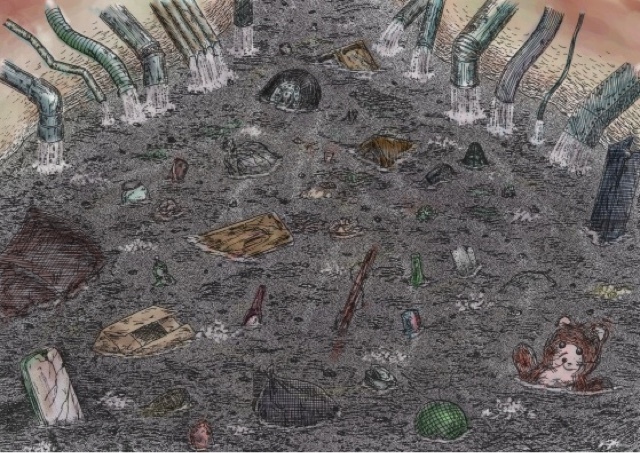 Many more are probably dying because of the wastes the humans dump. When you eat fish, Junior, you'd better be careful about what part of the fish you are eating ... Ha, ha, ha ..."
Senior was getting ill-tempered, Junior thought. If what the whale had said was true, he thought to himself, that would be no laughing matter. 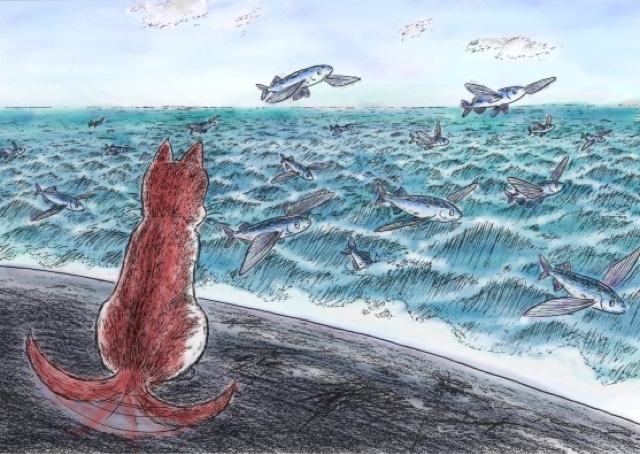 Sounding more normal, Senior added, "The humans treat the sea as a dumping site. It's deplorable ..."
Junior was sunk in deep thought. His memory of the past began to return to him. The humans he had lived with had a comfortable house and fed him delicious food. He thought his life would have been harder without relying on them. Without them, he would have spent lots of time looking for food himself. If he were lucky, he could have found enough for a day or two, but, he wondered if he could have found enough day after day without going hungry all the time. There were rain storms and bitter cold days outside. It would be terribly miserable, he thought, if he had had to live outside. He dared not live outside his humans' house. What he did not understand was how the humans were able to live in such nice houses and with plenty of food. They had transformed the whole town into a wonderful place to live and had made it look very pretty. They rode in mobile machines, and used tools run by electric power. How did they accomplish those things? He could not understand it at all. Anyway, they were smart creatures, he thought, though they usually behaved as if they were kings, the masters of the universe. They were quite different and not like whales in any way. He did not understand. If what Senior had said was true, why were the humans, who were so smart, causing so many problems for the fish and whales? Senior, meanwhile, seemed to be having the same train of thought. 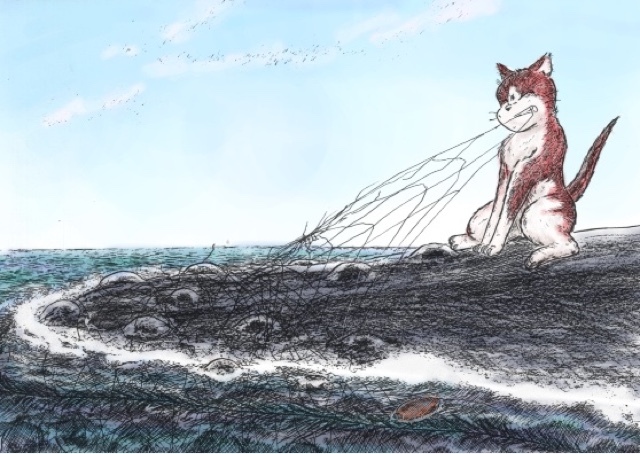 "Didn't it ever occur to the humans," Senior blurted out, " if they become too greedy catching too many fish, or if they dump waste in the sea, it's themselves that will suffer in the end because there will be no more fish left for them? I wonder if they have more brains than we do." Woods had been cut down, mountains flattened out, and more and more houses and buildings were being built everywhere. All problems a growing number of humans were creating, Junior thought. The humans were acting like reckless tigers not only on the land, but also in the sea. "I wish the humans would pay more respect to other creatures," Senior said. "While travelling to and from the sea in the south, I can feel something is changing every year. I have seen many bays and coastal wetlands being reclaimed and new land being made, pushing out into the sea. Near the coasts, some fish lay eggs. There fish are born and grow up. 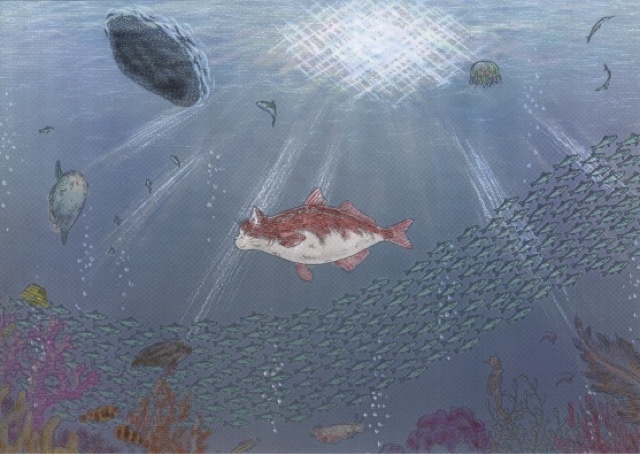 The coastal sea is precious to all of us living in the sea, including deep sea fish. 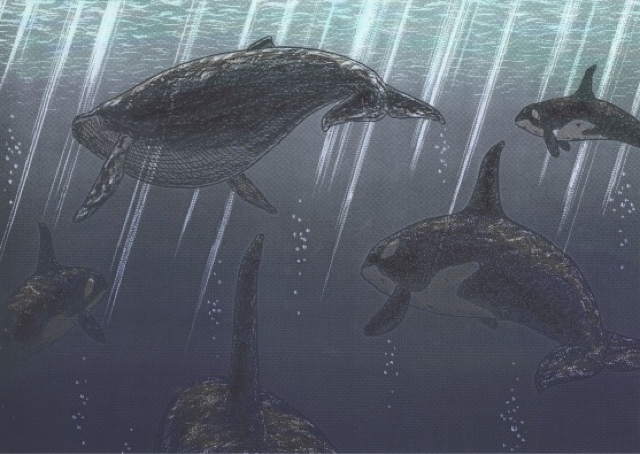 Whales used to play in the bays with their babies. The bays are no longer like the ones I used to know. It seems they are now off limits to us." "I wonder where the life of whales began, on land or in the sea? What I do know is that the whale used to be a land animal and came into the sea. So we are connected to both land and sea. Anyway, the ocean is precious to us. I wish the humans would take good care of it ..."
Senior became agitated. "Once in a while I come across a strange ship, not like a whale ship. It moves under the water and stays submerged for a long time. It has strange screws that make groaning noises. I have seen ships like this several times. It is rumored that they are destroyers, engaged in killing other ships. Some of them look like us, and some whales mistook them for our friends, went too close to them, and got killed." 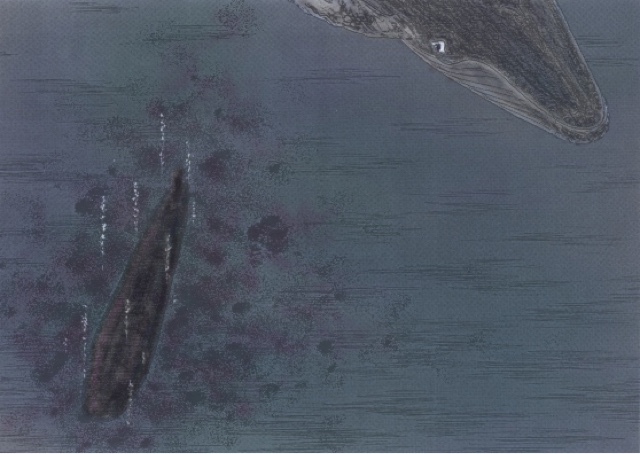 Besides these ships, you can see many other kinds of ships lying on the sea floor. They are dead ships. It is said they are haunted. They are not a place to play inside ..."
Junior recalled that he had seen a war movie on television. The ship Senior had just talked about, he thought, was perhaps the submarine used to fight the war in the movie he saw. He did not understand wars anyway. It was cruel things in which innocent people and all creatures were killed in droves. In contrast, he thought, the whales were peace-loving creatures. They liked to sing and jump instead of fighting. The humans were strange animals, Junior said to himself. "We're going to part soon," Senior said, his voice feeble and trembling, "My time is drawing near. If I am destined to die, I don't want to die in a miserable condition like this, being bound by a net." Hearing that, Junior again felt sorry for him -- and worried about himself, too. If Senior were to die in the sea, he would be drowned and die also. Junior shed tears, which trickled down from his eyes to his whiskers. "Oh, don't cry like that, Junior. Your body will run out of water." Junior tried to regain control, and said with a forced cheerfulness, "Senior, don't you cry when you are sad?" "Have you seen me cry?" Senior retorted. "What is the difference between your salty tears and the salty sea?" "Is that so?" said Junior. "Don't worry too much ... I'll carry you near the shore." The moment he said that, Senior flung his tail fins as hard as he could. Junior was startled and held tightly on to the whale's back. The water swirled and white foam formed on the waves. Senior turned his direction toward the land and headed for the horizon studded with dim lights. A short while later, he stopped and said to Junior. "Junior, you can get off me now. The tide of warm current will carry you to the shore safely." It was getting dark now, and though some lights were visible, Junior could not clearly tell the boundary between the land and sea. He knew, however, he would reach the land if he went toward the lights that perhaps were coming from some town. "Land animals should live and die on the land when their day comes," Senior said in a grave yet feeble voice. "Then you are going to die on land, too?" "No, we whales don't come out of the water and die on the land!" "But wait a second. Some whales were washed ashore and died there. 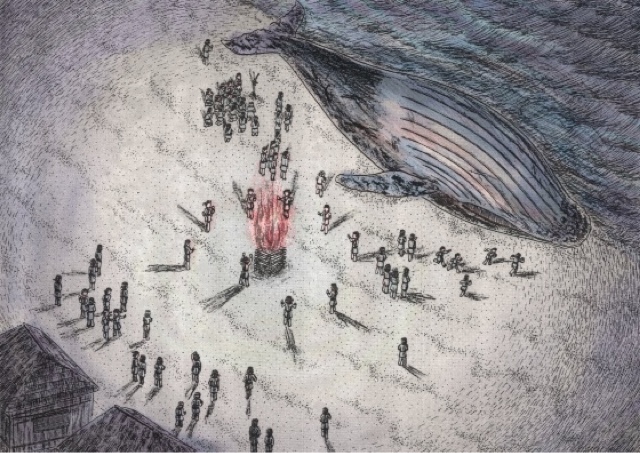 A legend says that when a whale died on land -- that was at a time when the humans did not yet possess supernatural powers -- humans held a festive ceremony. They were thankful and prayed to the God of the sea, to the God of the human beings, and to the God of the Whales. The meat of the dead whale was dedicated to the deities, and then the pieces of the meat were given to the people of the village. Nothing else was wasted including the blubber, fins, and bones. All were useful to the villagers." Senior fell into a deep silence. Junior anxiously waited. A long time passed and no words were heard from the whale. He wondered whether Senior had passed on. He opened his mouth out of concern. "To think of it ..." Senior opened his mouth, his voice heavy and grave. It seemed as if he had found the solution to the riddle of human beings hard to crack. "To think of it, the humans nowadays are no longer content with what they have been given by the Gods. "They are no longer satisfied with their own gifts, and are stepping out of the bounds of the roles assigned to them. They want more and more ... more spacious and comfortable housing, more delicious food and drinks they have never tasted before. They want tools that help them to get those things. With no regard to other species they have modified the nature of the earth". "They ignore the other beings living on the earth, not only us whales, but also the fishes, birds, insects, and other animals. The rivers, mountains, water, sea and sky -- everything had been given equally to all the creatures. All the gods had agreed with each other as to how much to give each of the creatures. 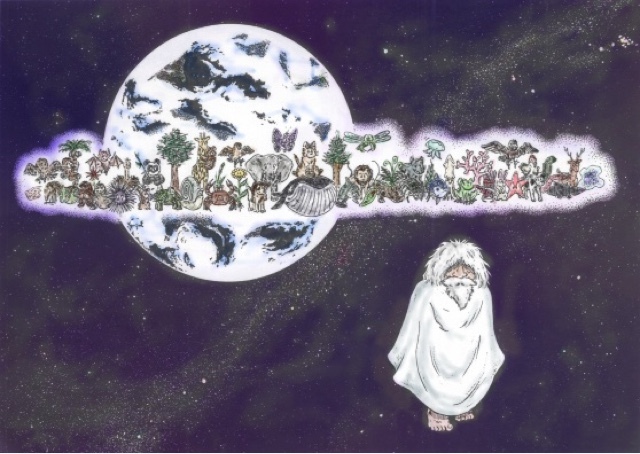 The peace has been held for a long time on this beautiful planet ... but now the humans are ignoring the rules of the Gods -- live and let live in peace. They have lost the belief in what they had pledged. The gods will soon turn their backs on the humans and leave them alone." Junior listened to the whale attentively. "I wouldn't mind being eaten by the humans if I could be useful to them. Rather, I would be glad to sacrifice myself to them. Every creature in one way or another should contribute to some useful cause." "I have a favor to ask you, Junior. I want you to do one thing when you arrive on the land. Please have a bite of my meat and prove to the others that I did not die a worthless death. It would make me more than happy to know that I would be of some help to others' living." Junior was aghast by what Senior had just said. How could he eat the meat, even a piece, of the friendly whale he had come to know ... even if he was not alive? It was true, though, that he had wished to try whale meat. However, Senior appeared not to be joking this time. Night came and a cold wind started to blow. Junior curled up in a tight ball to keep himself warm. Senior said to him: "You must be tired. Go to sleep. I'll sing a lullaby for you. It is a song my Mother used to sing for me when I was young. I remember it vividly even now." "Do you know how we grow up? It may be interesting for you to know. A mother whale gives birth to a single baby at a time. She feeds him or her with her milk. It takes many years for a whale to grow up. While they are growing, their mothers take good care of them. They teach their youngsters many skills and everything they need to know to live in the sea. Meanwhile, the youngsters are very close to their mothers, and depend on them a lot. Mothers often sing lullabies to their babies." Junior closed his eyes and lay his head down on Senior's back. He could hear Senior's heart ticking at regular intervals like a clock. The heartbeats were much slower than his own. He felt safe and happy. It reminded him of his infant days when he used to sleep next to his mother. The sky was clear and the sea still. The light from the Milky Way and some bright stars were reflected on the sea's surface. Junior started to fall asleep while listening to the song Senior was singing for him. After a long day come peace and sound sleep. Swim side by side with them. Amaze them with a big jump in the air! Show your friends you are the best. Listening to their happy chatter. The sound of waves brings peace. You'll feel happy and peaceful. You will know how wonderful it is to be alive. This world of the sea belongs to all of us. Sleep well, and you both will have a beautiful day tomorrow. Junior woke up. He found himself still on Senior's back. He did not see the vast sea and rolling waves. There was a shore of white sand in front of him. 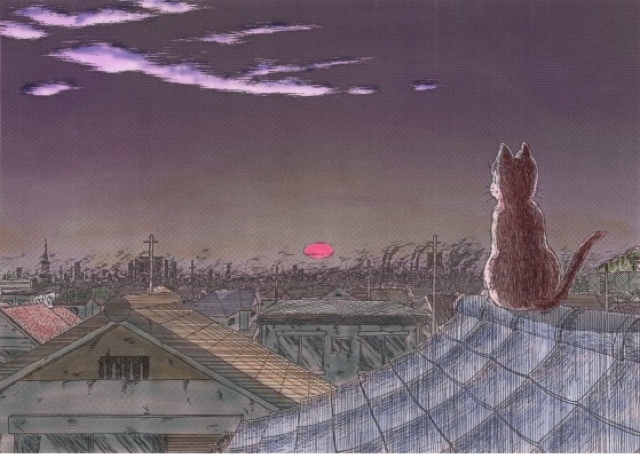 In the east, the sky, a little reddish, showed the sun was about to rise. "Senior, we are on the shore at last. Thank you, thank you, I don't know how to thank you for saving my life." There was no reply from the whale. Junior jumped up and down on his back in an attempt to wake him up and he yelled, but the whale lay still and did not move an inch. No longer breathing, his body stayed motionless. He would no longer sing beautiful songs, jump up and down in the waves, or swim in the ocean. On the sand Junior sat beside Senior, a large still body now. He was speechless from grief. Though he had spent only one day with him, it seemed as if he had known him for many years, and he started to cry remembering his friend. He kissed Senior's body. It tasted of tears and salty water. A ray of sun peeked over the horizon. A moment later, more light appeared. The sun began to rise up from the sea. The sky turned from black to purple to red to light blue as the day broke gradually. A panoramic view unfolded. 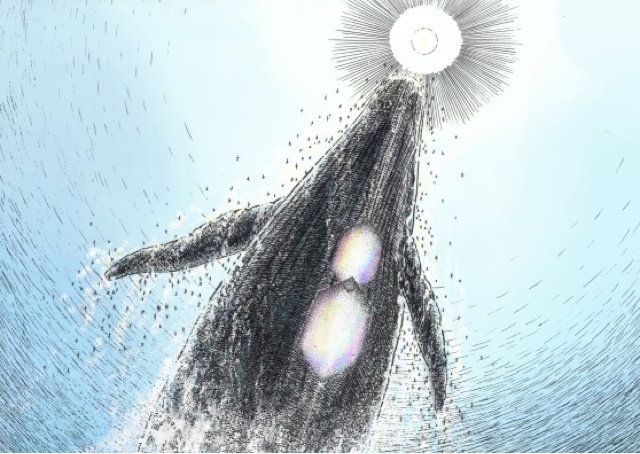 Then the unimaginable happened: A giant whale leapt out of the sea into the sky, and rose higher and higher toward the heavens. The water splashed and sparkled with light from the just risen sun. The light from the sun reflected on the whale in a prism of colors. How could he forget this unworldly scene, Junior thought. It was an absolutely unparalleled experience! The sky became brighter, and Senior's spirit was now nowhere to be seen in the sky. Where in the world did Senior's spirit go, Junior wondered. He must have set forth for a long journey that is far beyond the vast sea and the blue sky. His spirit must have reached a paradise like the ice-filled Antarctic sea, where he could play with many of his friends from the past. Where else he could be other than in a blissful paradise like that, Junior mused. Soon Junior found his way back home. After the day of his encounter with Senior, he stopped eating meat from cans and tried his best to catch food by himself. At any rate, he was endowed with his own legs, paws, claws, and fangs, which were given him by the God of the cats for hunting purposes. He yearned to see Senior again and chat with him: he wished to see him jump in midair from the sea and to listen to his enchanting melodies. And above all, he wished to hear more of Senior's stories again that he had enjoyed so much on that magic day and night not long ago. 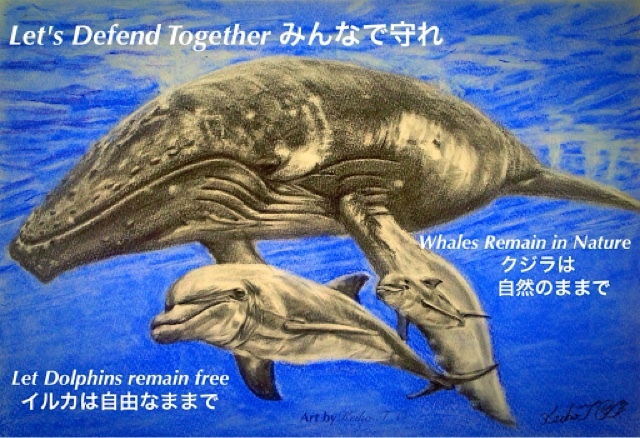 Whales and dolphins want to also live long as human beings, they want to fulfill their life. That can be said for any creature. Man takes the lives of animals, but even if they to eat while thanking the life they had taken, even if they try to use without waste, the bone and skin, I think humans are doing this to satisfy their lust. You do not change the fact that it is killed anyway. Animals were not raised to be eaten by humans. They should live and die near their own birthplace. Those whom eat animals and take their life, question "then it is ok to take the lives of the livestock?". If possible, it would be amazing if we do not kill livestock. But where are these livestock born? They are a production of human selection. Humans are responsible to determine the purpose of the livestock, and the power is in their hands. If you eat livestock meat, it is important for them to live in harmony and in peace in which they were born in until they die. When they die, it is necessary for the humans to bear responsibility and the ability to end the life of the livestock peacefully. In Korean and Chinese culture, is it ok for them to eat cats and dogs? This is a bad thing, for they are not livestock, but a animal that coexists with humans since the past ages. But animals that helps human beings are considered as family. So therefore, they should not be killed because of their population increase. They are human creations, therefore they are the human's responsibility to take care of them well. But wildlife is not in the hand of man. They were born to live in nature. For human beings that do not co-exist in nature is of the other side of the border of creatures. 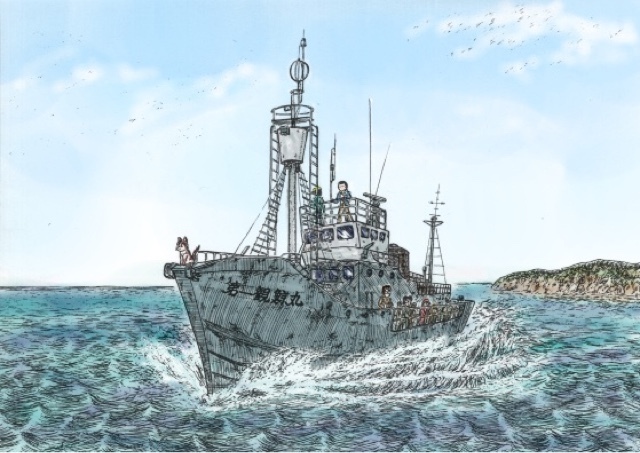 For the people of Taiji, whale meat is a food of culture. Meat is consumed anywhere in any country but Japan is the reason that included whale meat in the food "pool". A person who intends to interfere with it, they argue that mercury is contained in the meat in a large amount, or a risk of extinction, they will not be admitted to each other with a variety of reasons. In the United States. it is reported in the news every time Taiji enforces the fishing. Environmental protection is exposed in schools as well as nature conservation. 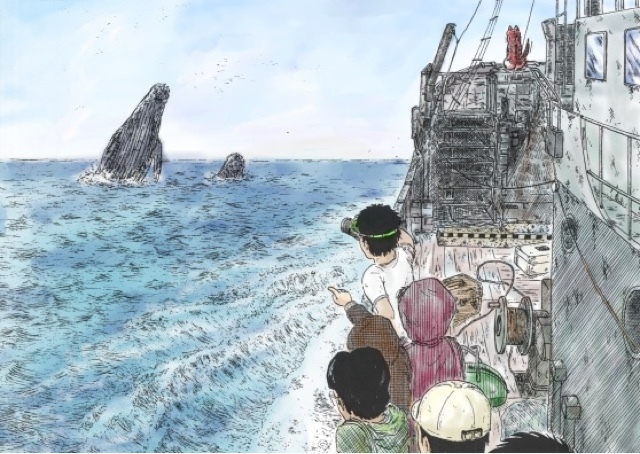 Students were shown the "The Cove" in education of animal protection and to inform that Japan a whaling country. Parents teach the mystical beauty of the whale to children. Right now, people around the world are watching little fishing village of Taiji. To determine whom are barbaric and lash out to the whaling and those whom do not, does not matter to the situation. Japan is a developed country in advances of technology, but The concept of nature and animal protection have not advanced in the minds of Japan. Many people think that any organism are a lower form of themselves. Non-intelligent and barbaric. From digital, as age is changing from gasoline to electric analog, it should also change the food culture. And because the age of hunting is now over in developed countries, leave the hunting and gathering to the indigenous people whom actually need this resource and sustain wildlife properly.